Quantity : 1 set of collets as selected. Accurate, ground set of collets with max. As selected in drop down menu. Range is normally nominal size minus 0.5(ER16)-1mm(ER40) according size, (recommended is -0.3-0.5mm for long life). 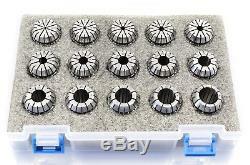 ER16 10pcs 0,5-1, 1-2, 2-3, 3-4, 4-5, 5-6, 6-7, 7-8, 8-9, 9-10mm ER20 12pcs 2-1,5 3-2,5 4-3,5 5-4,5 6-5,5 7-6,5 8-7,5 9-8,5 10-9,5 11-10,5 12-11,5 13-12,5mm ER25 15pcs 2-1, 3-2 , 4-3, 5-4, 6-5, 7-6, 8-7, 9-8, 10-9, 11-10, 12-11, 13-12, 14-13, 15-14, 16-15mm ER32 11pcs 3-4, 4-5, 5-6, 7-8, 9-10, 11-12, 12-13, 14-15, 15-16, 17-18, 19-20mm ER32 18pcs 3-2, 4-3, 5-4, 6-5, 7-6, 8-7, 9-8, 10-9, 11-10, 12-11, 13-12, 14-13, 15-14, 16-15, 17-16, 18-17, 19-18, 20-19mm ER40 7pcs 5-6, 7-8, 9-10, 11-12, 15-16, 19-20, 24-25mm ER40 15pcs 3-4, 4-5, 5-6, 7-8, 9-10, 11-12, 12-13, 14-15, 15-16, 17-18, 19-20, 20-21, 21-22, 24-25, 25-26mm. Length of collet: varies on size. Several other types are available from our. Or will be listed soon. Brand : (ECO) monitored, very good quality. Weight : 500gr-4.300gr + Packaging. The item "FP, (ECO) ER16 ER20 ER25 ER32 ER40 7-18pcs COLLET SET 0.015 normal runout" is in sale since Wednesday, May 23, 2018. This item is in the category "Business, Office & Industrial\Metalworking/Milling/Welding\Milling". The seller is "atisshop" and is located in Gyr, 9012.